ARE YOU TASTING THE REAL THING? Do you remember taking medicine when you were a kid? I’m not sure how children’s medicine tastes now, but back in the day when I was a kid, most of it tasted awful! As kids we didn’t know what was worse, the sickness or the medicine? The bottom line was no matter how terrible the medicine may have tasted, it was necessary to get us well. Did you know that many people view Bible Study, prayer, worship, and walking with God much like bad-tasting medicine? They know they need it, but they don’t really enjoy it. They just hold their nose, so to speak, to get it down. How sad! How twisted! The Christian life is not bad-tasting medicine. The Christian life is a great-tasting feast! It is a day-by-day, moment-by-moment walk with the glorious, gracious King of the universe. It is an exciting adventure with the God who calls us to get out of the boat and walk on the water with Him. It is a life filled with love, joy, peace, acceptance, meaning, and fulfillment. It is the most wonderful life of all. Think about it: what could be better than having a genuine, personal, loving relationship with the God who spoke the worlds into existence? Be totally honest for a moment. Are you enjoying your relationship with God? Are you feasting on His goodness? Are you really walking with the King? If you are not quite sure, there is an easy way to tell. Are joy and peace in your heart right now? You see, when Jesus, the Prince of Peace, is truly allowed to sit on the throne of your life, then your life is filled with His peace and joy, regardless of the present circumstances. Granted, you may be suffering with sickness, heartache, or pain today. David wrote Psalm 34 from the dark and lonely cave of Adullam. I certainly understand that circumstances can be very difficult at times, but there is a peace that passes understanding when you are yielded to the Lord. Perhaps you have believed the lie that a life lived for Jesus Christ is a second-rate life, devoid of fun and excitement. Nothing could be further from the truth. The Scripture says, “O taste and see that the LORD is good” (Ps 34:8). God invites you to take a true taste of what it means to walk with Jesus. He came to this earth that we might have life, abundant and overflowing (see John 10:10). If that doesn’t describe your life today, then yield to Jesus anew and afresh. Take a taste of the real thing, and see for yourself that the LORD is good, and He blesses those who walk with Him! P.S. If this email has spoken to you, please let me know at pastorjeff@fromhisheart.org. You are important to God and to us at From His Heart! Jesus promised His disciples that He would send them a Helper when He left them and that this Helper would guide them into all truth. Who is this "Helper" Jesus was speaking about? 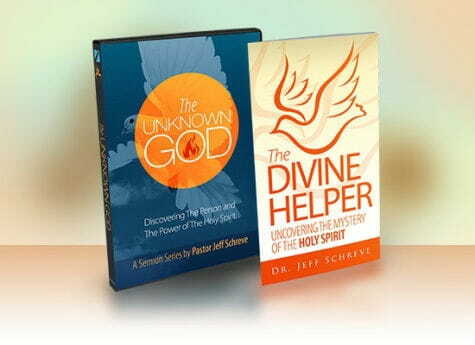 In his brand new booklet, Dr. Jeff Schreve introduces us to and teaches us about the divine helper Jesus promised: the Holy Spirit.